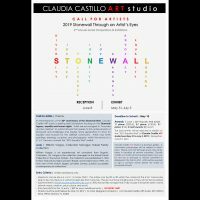 In remembrance of the 50thanniversary of the Stonewall Riots, Claudia Castillo ART studio is seeking artist submissions focusing on the Stonewall legacy, equality and human rights. Artists are encouraged to “innovate and be creative” to submit artwork that speaks to the achievements of Stonewall and challenges and inspires future generations to strive for equality and inclusion for the LGBTQA community. 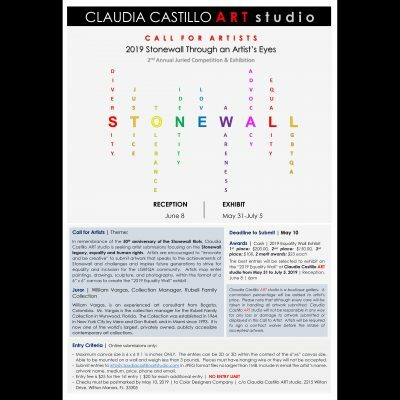 Artists may enter paintings, drawings, sculpture, and photography, within the format of a 6” x 6” x 1.5” canvas to create the “2019 Equality Wall” exhibit. Maximum canvas size is 6 x 6 X 1 ½ inches ONLY. The entries can be 2D or 3D within the context of the 6”x6” canvas size. Able to be mounted on a wall and weigh less than 3 pounds. Pieces must have hanging wire or they will not be accepted. 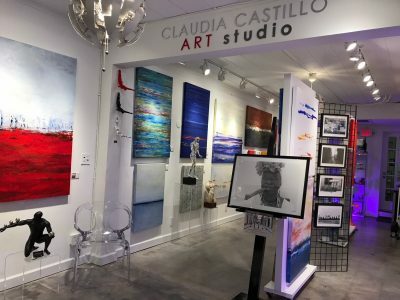 Submit entries to info@claudiacastilloartstudio.com in JPEG format files no larger than 1MB. Include in email the artist’s name, artwork name, medium, price, phone and email.